．Direct heating work piece increase the efficiency and heating rate reduced the oxidation level of surface of the forged metal. ．No air and heat pollution without burning coal and fuel. ．Power output can be adjusted continuously that control the best forged metal temperature and keep the best output and quality . ．One main machine equipped with different heating coil, when heating different metal and size or heating coil need to be repair it will not affect the output and quality. ．Good mobility : with higher heating speed so it take less time from power on the furnace to forging process. 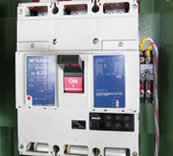 DC power supply is controlled by fast response non-contact SCR switch. Power supply with extraordinary condition will be immediately cutoff in 8.3ms. ．Automatically correcting input power according to charge material condition. ．that offers the system higher overall efficiency. 1 Fast response circuit breaker of main equipment. 2 ON-OFFpower supply without spark normally. 3 High speed system cutoff as over current and low voltage appear. ．Stepless control of electric power limit. ．Power current monitoring and power up-limit setting. ．Voltage, current or TOT exceeds the preset value, the power supply will be cut off automatically by SCR switch. ．There are 18 signal indicators on control panel and each PC board also has its different signal indicator on board to show running condition of the equipment. So, it is easy to carry out troubleshooting even an unprofessional person.